From the Cartoon Network Transformers Animated TV series. Deluxe action figures transform from vehicle to robot. Help the Autobots wage their battle to destroy the evil forces of the Decepticons! Aliens have landed in Detroit! 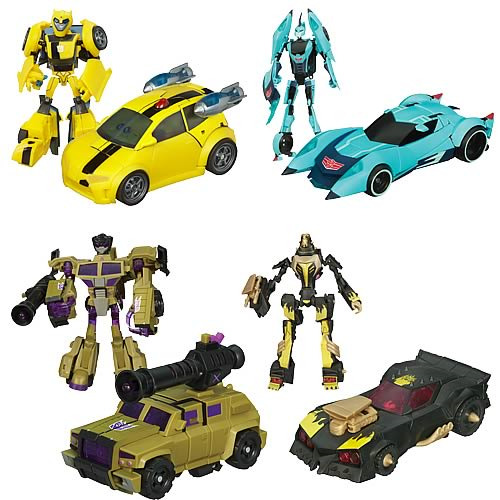 From the hit TV series, the Transformers Animated Action Figures bring big action with these colorful figures. The Autobots are ready to save the Allspark from the forces of evil, but the Decepticons are coming fast. Will the Autobots save the world from Megatron's forces? It's all up to you when you get these terrific Transformers action figures!